Maintain a positive attitude. – Positive thinking is at the forefront of every great success story. The mind must believe it can do something before it is capable of actually doing it. So be aware of your mental self-talk. We all talk silently to ourselves in our heads, but we aren’t always conscious of what we’re saying or how it’s affecting us. Start listening to your thoughts. If you hear negative thoughts, stop for a second and replace them with positive thoughts. As the Dalai Lama once said, “The way to overcome negative thoughts and destructive emotions is to develop opposing, positive emotions that are stronger and more powerful.” For some practical positive thinking guidance, I recommend reading The Power of Positive Thinking . Be kind to yourself. – If you had a friend who spoke to you in the same way that you sometimes speak to yourself, how long would you allow that person to be your friend? The way you treat yourself sets the standard for others. You must love who you are or no one else will. Embrace problems as a natural part of growing. – Part of living and growing up is experiencing unexpected troubles in life. People lose jobs, get sick, and sometimes die in car accidents. When you are younger, and things are going pretty well, this harsh reality can be hard to visualize. The smartest, and oftentimes hardest, thing we can do in these kinds of situations is to be tempered in our reactions. To want to scream obscenities, but to be wiser and more disciplined than that. To remember that emotional rage only makes matters worse. And to remember that tragedies are rarely as bad as they seem, and even when they are, they give us an opportunity to grow stronger. Create your mission statement. – Mine was simply “To translate what gives me joy, fulfillment and makes me genuinely happy into a career that will allow me to work for myself and spend more time with my family.” This meant starting my own business as a coach to help individuals and small business owners get what they want out of their life and business. Formulating this sentence allows us to create a short mission statement that summarizes exactly what we want from life, which will help to keep it in the forefront of our minds when we’re making important decisions. Exploit the resources you do have access to. – It’s not about having access to countless resources; it’s about exploiting the resources you do have access to. Stevie Wonder couldn’t see, so he exploited his sense of hearing into a passion for music, and he now has 25 Grammy Awards to prove it. What resources do you have access to that you are not using? Help others when you are able. – In life, you get what you put in. When you make a positive impact in someone else’s life, you also make a positive impact in your own life. The more you help others, the more they will want to help you. Love and kindness begets love and kindness. Narrow your focus. – Concentrate your efforts on smaller and smaller areas. When your efforts are diffused over a wide area they won’t have much of an impact. So focus on smaller areas and your efforts will be felt more fully. It could take time for change to happen, but keep that focus narrow. Stretch your comfort zone by trying new things. – Doing the same exact thing every day hinders self growth. If you keep doing what you’re doing, you’ll keep getting what you’re getting. Growth happens when you change things – when you try new things – when you stretch beyond your comfort zone. Create and pursue S.M.A.R.T. goals. – Successful people are objective. They have realistic targets in mind. They know what they are looking for and why they are fighting for it. Successful people create and pursue S.M.A.R.T. goals. S.M.A.R.T. goals are Specific, Measurable, Attainable, Relevant, and Timely. When you identify S.M.A.R.T. goals that are truly important to you, you become motivated to figure out ways to attain them. You develop the necessary attitude, abilities, and skills. You can achieve almost any goal you set if you plan your steps wisely and establish a time frame that allows you to carry out those steps. Goals that once seemed far away and out of reach eventually move closer and become attainable, not because your goals shrink, but because you grow and expand to match them. Make your own needs a priority. – Stop putting your needs on the back burner. The most painful thing is losing yourself in the process of loving someone too much, and forgetting that you are special too. Yes, help others; but help yourself too. If there was ever a moment to follow your passion and do something that matters to you, that moment is now. Learn and practice one new skill every week. – Self-reliance is a vital key to living a healthy, productive life. To be self-reliant one must master a basic set of skills, more or less making them a jack of all trades. Contrary to what you may have learned in school, a jack of all trades is far more equipped to deal with life than a specialized master of only one. And besides, learning new skills is fun. Check out this article, this article, and this book. Identify the lesson in every situation. – Everything is a life lesson. Everyone you meet, everything you encounter, etc. They’re all part of the learning experience we call ‘life.’ Never forget to acknowledge the lesson, especially when things don’t go your way. If you don’t get a job you wanted or a relationship doesn’t work, it only means something better is out there waiting. And the lesson you just learned is the first step towards it. Express gratitude. – When you appreciate what you have, what you have appreciates in value. Kinda cool right? So basically, being grateful for the goodness that is already evident in your life will bring you a deeper sense of happiness. And that’s without having to go out and buy anything. It makes sense. We’re going to have a hard time ever being happy if we aren’t thankful for what we already have. Savor the joy of simple pleasures. – I’ve said it before and I’ll say it again, the best things in life are free. They come in the form of simple pleasures and they appear right in front of you at various locations and arbitrary times. They are governed by Mother Nature and situational circumstance and captured by mindful awareness. It’s all about taking a moment to notice the orange and pink sunset reflecting off the pond water as you hold hands with someone you love. Noticing these moments and taking part in them regularly will bring unpredictable bursts of happiness into your life. 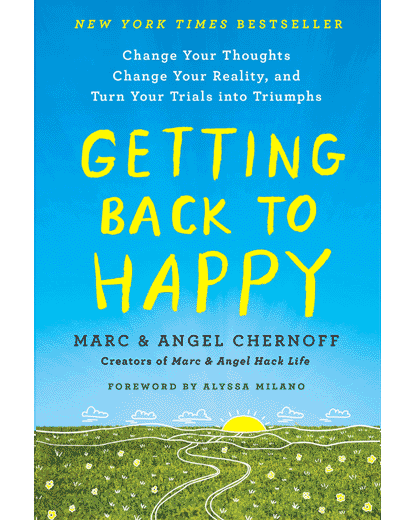 Read The Happiness Project . Stop caring about what everyone else wants for you. – Unfortunately, just before you take your first step on the righteous journey to pursue your dreams, people around you, even the ones who deeply care for you, will usually give you awful advice. It’s not because they have evil intentions. It’s because they don’t understand the big picture – what your dreams, passions and life goals mean to you. They don’t understand that, to you, the reward is worth the risk. So they try to protect you by shielding you from the possibility of failure, which, in effect, also shields you from the possibility of making your dreams a reality. Make small, positive changes every day. – How do you eat an elephant? One bite at a time. The same philosophy holds true for making changes in your life. Making small, positive changes – eating a little healthier, exercising a little, creating some small productive habits, for example – is an amazing way to get excited about life. Read great books. – The Web is grand. With its fame for hosting informative, easy-to-skim textual snippets and collaborative written works, people are spending more and more time reading online. Nevertheless, the Web cannot replace the authoritative transmissions from certain classic books that have delivered (or will deliver) profound ideas around the globe for generations. Read books that are packed with wisdom capable of igniting a new understanding of the world. Keep an open mind. – Someone else doesn’t have to be wrong for you to be right. The highest form of ignorance is when you reject something you don’t know. We all have our own unique path and feelings. When you judge another, you do not define them, you define yourself. It’s one thing to feel that you are on the right path, but it’s another to think that yours is the only path. Embrace change. – If nothing ever changed there would be no sunrise the next morning. Most of us are comfortable where we are even though the whole universe is constantly changing around us. Learning to accept this is vital to our happiness and general success. Because only when we change, do we grow, and begin to see a world we never knew was possible. And don’t forget, however good or bad a situation is now, it will change. That’s the one thing you can count on. So embrace it, and realize that change happens for a reason. It won’t always be easy or obvious at first, but in the end it will be worth it. Let go of the past. – Don’t let the past steal your present and future from you. Accept the fact that the past in not today. You might not be proud of all the things you’ve done in the past, but that’s okay. The past is not today. The past cannot be changed, forgotten, or erased. It can only be accepted. We all make mistakes, have struggles, and even regret things in our past. But you are not your mistakes, you are not your struggles, and you are here NOW with the power to shape your day and your future. Face your fear of failure. – You might fail. And that’s OK. Failures are simply stepping stones to success. No matter how it turns out, it always ends up just the way it should be. Either you succeed or you learn something. Win-Win. The biggest mistake you can make is doing nothing because you’re too scared to make a mistake. If you can’t handle failure, then you can’t handle success either. Be proud of yourself. – Being proud isn’t bragging about how great you are. It’s more like quietly knowing that you’re worth a lot. It’s not about thinking you’re perfect – because nobody is – but knowing that you’re worthy of being loved and accepted. Boost your self-esteem by recognizing your accomplishments and celebrating them. Acknowledge your positive qualities, and when you come across a quality in yourself that you aren’t proud of, don’t sulk in your sorrows, proactively work on correcting it. Read Today We Are Rich . Be attentive to your stress level. – Slow down. Breathe. Give yourself permission to pause, regroup and move forward with clarity and purpose. When you’re at your busiest, a brief recess can rejuvenate your mind and increase your productivity. These short breaks will help you regain your sanity and reflect on your recent actions so you can be sure they’re in line with your goals. Let go of regrets. – Follow your heart. Be true to yourself. Do what makes you happy. Be with who makes you smile. Laugh as much as you breathe. Love as long as you live. Say what you need to say. Offer a helping hand when you’re able. Appreciate all the things you do have. Smile. Celebrate your small victories. Learn from your mistakes. Realize that everything is a lesson in disguise. Forgive. And let go of the things you can’t control. Keep learning and nurturing your personal growth. – Achieving higher consciousness comes from your commitment to personal growth. You’re a totally different person compared to who you were at this time last year; next year will be no different. How much you grow and who you become is up to you. But remember, the acquisition of knowledge doesn’t mean you’re growing; growing happens when what you know changes how you live. You guys give the most amazing advice. Congrats on your blog’s 6th birthday. Keep the inspiring articles coming. A perfect recap. Such useful, motivating reminders for life. Bookmarked and shared it already. Thank you so much. Happy birthday to this site. Can’t argue with any of those. What I’d add is that the overriding principle I think is balance. Sometimes when you give a bunch of tips, you find that they all make sense even though some of them are a little bit in contradiction. That’s because the healthy thing is to balance the two poles of each issue. Sometimes circumstances mean you temporarily have to lean toward one side or the other, but overall balance is a healthy goal. Thank you for your inspiring posts. This list is a great reminder and summary! I did not read through the post yet, but “practical” ideas when it comes to self improvement makes this post worthwhile. I am going to read it as first thing in my free time today, thanks m&a! Happy anniversary, and thank you for the amazing collections you put together. I have enjoyed many of them and always find a nugget or two that strikes home immediately. It’s really amazing the way my perspective changes based on my answers. I learn so much from you everyday. Your site has changed my life and made me more open to the possibilities that live in my heart. Happy birthday Marc and Angel .com! 6 long years of caring and sharing – it must be such a proud moment for you both. I can just say thank you from the bottom of my heart for since the day I have started reading you my life has changed in leaps and bounds. Looking forward to more such years of sharing and caring! I’m almost 70 years old and still enjoy and learn so much from all your helpful tips! Bless you both, and thank you for providing such a wonderful source of daily inspiration for all ages! My goodness, I love this site! You guys always know how to make me smile and think about what I want for my life. While I don’t completely agree that we shouldn’t do things if we can’t do them right (there’s some room for debate here), I nevertheless enjoyed every point on this list. Great work, as always. Such an inspiration – you two always put out some of the best self improvement advice on the web!!! Your blogs boost my energy and bring out the happiness in me. Happy Birthday to your great website! Happy Birthday, Marc and Angel! Brilliantly hacking life, one day at a time. Your site continually serves as positive reinforcement, and is greatly appreciated! GREAT 30 for this list! Great list. Seems to me if you excel at what you do and treat yourself right, everything else will fill into place. Lovely post! Lots of timeless wisdom. I am so grateful I discovered your site and subscribed to your emails, which are so helpful and encouraging. Raised in a smart, talented, but fearful and destructively perfectionist family, I’ve struggled all my life with low self-esteem, depression, and self-hatred that led me finally to suicide-in-slow-motion: 15 years of life-destroying drug abuse. Your wonderful insights and pep talks help me counter negativity and despair every day as I work to move beyond guilt and feelings of failure to reclaim the remainder of my life and put my time and energy to positive, productive use. Congratulations on your blog’s six-year anniversary! Thanks for compiling a recap of these timeless articles. I always look forward to receiving these helpful reminders, insights and words of wisdom. Happy 6th Birthday. I am so grateful I found your site always filled with insightful messages! Love no 29 says it all for me!! Bless you both. What a great list! I do try to stay postive and happy and enjoy life, but like everyone I do have times when it all seems like an uphill battle. You say to embrace change, but this is hard for me I am not someone who likes change. I’m working on it. Congratulations on your 6th anniversary – and thank you both for your site. I only recently discovered you guys and love it that I can start my day with your wonderful words and insightful way of looking at life. Happy sixth birthday, Marc and Angel! I always enjoy reading your posts – bite-sized inspiration for first thing in the morning – and this one was particularly rich in food for thought. Thank you for sharing your advice! Happy 6th!! U guys are absolutely amazing. I look forward to reading ur blogs. Keep them coming! Love you guys. I have turned so many people on to your site. Your messages are so right on, all the time and truly inspirational. I print them each day and keep in a binder to read when I need a lift. I wish there was a “print” icon so I can clearly print the article and not everything else?? Happy Birthday and thanks for sharing your wisdom. I love to read your blog. And then I love to read it over and over. Thanks for the awesome advice that you give. So uplifting, and such feel good lessons for life. I have no clue how many times I’ve read this over and over this morning. It’s all so true. I love the awesome stuff you guys write and share. 🙂 Thank you for this post that opened my eyes to certain faults of mine. Thank you so much for sharing these inspirational posts. Happy Birthday to your wonderful blog! I have to say, I have been searching for this sort of blog/site for the longest time and it brings me great joy to read and share the articles. Thank you thank you thank you for the amazing tips, stories, everything! live, laugh and love! Six years of making great and unparalleled impact in lives. Congratulations! Unequaled motivation as usual! Congratulations on the milestone and thanks for all the motivation! You obviously don’t need to be reminded again, but your posts have had a positive impact on the world. Best wishes and here’s to six more inspiring years of practical tips for productive living! Great one again from you, whenever i get your email, i just cant wait to come here to read the full post. Many people who have had a very privileged child hood grow up thinking that the world will always be at their beck and call. Even when they grow up, they believe that they will always get what they want. But as you have rightly said, expect to have problems in life. Embrace problems as a natural part of growing! Great list, Thanks for writing it. It’s definitely the smaller steps that i get caught up on even though I have lofty big picture dreams and goals. “..growing happens when what you know changes how you live.” – that sums it up for me. Enjoyed the reading and thanks for the great articles. This just gave me so much hope for my bright future. I can feel the change in myself already. Thanks for this article. Amazing, uplifting, inspirational… simply beautiful Thank you so much! Keep changing lives guys! Thanks for such inspirational article. The simple truths of life that we know but often forget. I discovered your blog by accident, but I feel grateful for it. Your blog is definitely a guiding light for me when I’m down. Thank you… and keep up the good work. This will help me as i try to better myself. Thanks.